The word devastation may sound harsh, but it's true. 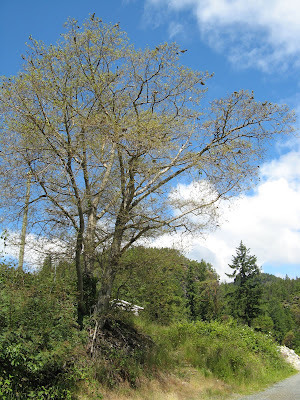 Take a look at this alder tree at the Shinglemill Marina with newly hatched tent caterpillars. Yes, a few leaves have been stripped down to the veins, but by and large the foliage is intact. The following picture is just two weeks later. All those green leaves have been devoured. The caterpillars have eaten themselves out of house and home, letting the blue sky shine through where once there was a canopy of leaves. Our summer sun has been interspersed with cloudy afternoons. On this one, the reflection of a giant salamander roams across the face of Goat Island. 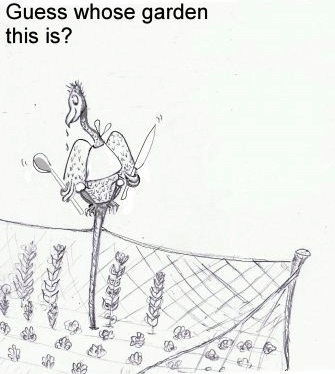 I wonder what he'll find to eat. I've mentioned before that Powell Lake is both a recreational and working lake, and boats are an important part of each function. From our front porch at the float cabin, we see work boats, tugs, barges and log booms traveling up and down the lake. One classic tug that plies our waters is the Marline W.
The Marline W is a wooden hull classic tug. It's moored in the Powell Lake (Shinglemill) Marina, but can be seen up and down the lake doing a variety of jobs. Here she's towing a barge that brought building materials up to a float cabin that was being rebuilt. I know a wood hull is a challenge to maintain, but isn't she a beauty? On Highway 101 just north of the Wildwood section of Powell River you'll find an access road heading down to Gibsons Beach. 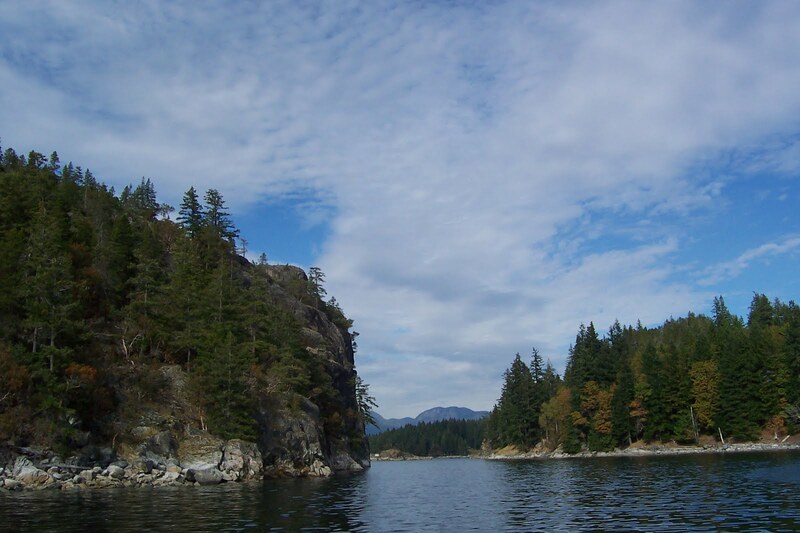 Gibsons is a day use beach that is often uncrowded. It offers trees for shade, picnic tables, a grassy bluff, and a mix of rock and sand at the shore. There's plenty of parking near the picnic area. Or you can drive around to the south side to find a rustic boat ramp and more parking. The Boardwalk Restaurant is located in Lund, BC, where Highway 101 (the Pan-American Highway) meets its northern terminus on the Strait of Georgia. The restaurant sits gracefully on pilings over the shallow bay behind the Lund Marina. Take a walk along the scenic boardwalk and stay for a wonderful meal. I had some business to conduct in Lund (delivering some Coastal BC Stories books to Deborah at Tug-Guhm Gallery), so I took the opportunity to have lunch at The Boardwalk Restaurant. The location over the water right next to the marina can't be beat . Even though it rained earlier in the day, they let me eat outdoors on the deck. The menu is varied, with an emphasis on local seafood. The day I was there you could get spot prawns right off the boat, and fresh clams, mussels, sockeye salmon, ling cod, and halibut. There are other items including burgers and steaks. The Boardwalk is known locally for their excellent fish and chips. Since it was lunch, I opted for the one piece salmon fish and chips. The salmon was battered in a very crispy crust and came with homemade fries and tartar sauce. A small portion of fresh greens with vinaigrette rounded out the tasty meal. To go along with it, I picked an on-tap beer from the new Powell River Townsite Brewery. Now that make a "working day" well worth the trip. Last week I shared remnants of the old Wildwood Bridge spanning Powell River. This week I'm sharing its replacement. Thanks to Paul at A Powell River Photo Blog, I got some information about the new bridge. In his post, View of a Bridge, I learned that it was built in 1966 (well before my time in Powell River) and is of a truss arch design. Check out Paul's post. I like the angle in his picture. We drive over the bridge to get from town to the Shinglemill marina to head up the lake. We are always in such a hurry to get home, we don't take much time to appreciate it's structure or beauty. One morning last week, Wayne woke up early and saw an interesting sight. I'm a late sleeper, but he though it was important enough to wake me up. Two Canada Geese were sleeping on the boom log in front of our cabin. Amazingly, they were standing on one leg with heads tucked under their wings. I woke one up, but he stayed standing on one leg. With such a huge body weight (about 3-9 kg/7-20 lbs), it must take a lot of strength and balance to sleep that way. I told Wayne to keep an eye on them. After all, this isn't a bed and breakfast resort. Geese have been known to hop on my floating garden and have a snack. I told our friend Ed, and later I got this in my email. Wednesday was the first day of summer, a time of year I look forward to with much enthusiasm. One reason is long sunny days. Here's a wide angle shot to show you the difference between winter and summer sunrise. Sunrise over the highest peak on Goat Island on the first day of summer was 7:54 a.m. Sunrise on the first day of winter was well to the south and at 9:45 a.m.
Sunset over the Bunster Range to the west was at 5:34 p.m., making our summer sunlight last for nine hours and forty minutes. Compare that to less than two hours in December. Like Goat, the Bunsters are pretty tall. Even though the direct rays of the sun were gone, it was light until well after 10:00. Boats are an integral part of Coastal British Columbia. Captain George Vancouver discovered and mapped much of Coastal BC in 1792 by sailing ship. A tradition to use the water for work and play has continued through the years. 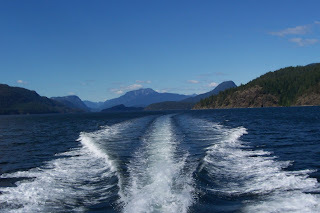 Boats and ferries provide transportation up and down the coast. Tugs and barges move timber, products, and other resources to and from market. Commercial fishing boats ply our waters almost daily. Boats also provide residents and visitors with recreation and fishing possibilities. Reel Therapy in Powell River's North Harbour is what I would call a skookum (strong) welded aluminum sport fishing boat. She's all decked out for prawns and fishing, of course. I think I could use some of that kind of therapy myself. In Powell River, visit Jim at Marine Traders and Sam at Powell River Outdoors (PRO) for your outdoor and fishing needs. And while you are here, join in some of our exciting fishing contests. I planted my garden this spring in late March. I included quite a bit of spinach. We like to eat it fresh in salads, and creamed. But even in a small garden, you can get a little too much produce coming in all at once. The recent warm weather made all of my spinach start to bolt. Rather than lose it, I decided to pull all the plants and preserve what was left by freezing and drying. I picked and trimmed the spinach out in the garden. All of the roots, stems and damaged leaves went into my compost pile. One bag was saved fresh for salads. I always say the Economy Shop thrift store has what I need, when I need it. 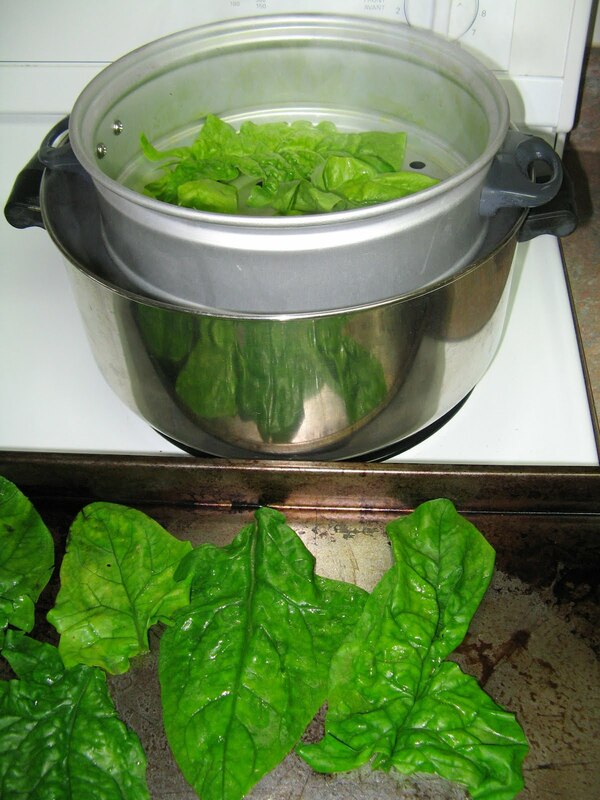 Can you believe it, the day I was going to preserve my spinach, I found a steamer to fit over a large pot. It was perfect for blanching. For the spinach I planned to freeze, I blanched it using steam for two minutes. For the spinach I wanted to dry, I blanched it for only one minute. I used the smaller leaves for freezing. As you know, spinach cooks down quite a bit, even with brief blanching. Out of two big bags of leaves, I got two containers to freeze. They will be perfect later for creamed spinach. One container will easily serve both of us. The larger leaves I used for drying. I've never dried spinach before. One recipe said to blanch it for one minute first. Another said to dry it fresh. I went with the blanching method. I put my electric oven on the lowest temperature, 150 degrees. I used a spatula to turn the leaves several times to prevent sticking. In about three hours the leaves were completely dry and crisp. They became very thin, crumbling in the pan. That should be OK. I want to use them crumbled in soups anyway. I think next time I will try it without blanching. A recent medical tragedy has brought renewed focus on the safety needs for people living off the grid. A recent article in the Powell River Peak (Cabin numbering improves medical response) highlighted that all float and land cabins on local lakes are getting "street" numbers, just like city-folk. The Cabin Owners Association has worked with local authorities over the years to develop numbering plans, but the regional emergency system has no knowledge of local conventions. When Troy Marshall called 911 about his brother's heart attack, first responders didn't even know where Powell Lake was, let alone a remote float cabin. Thanks to Troy's efforts, we now now both GPS locations and "street" numbers. In our case, 10767 Powell Lake. Now if we call 911 with an emergency, first responders will know where we are located. Getting there is a whole different story. 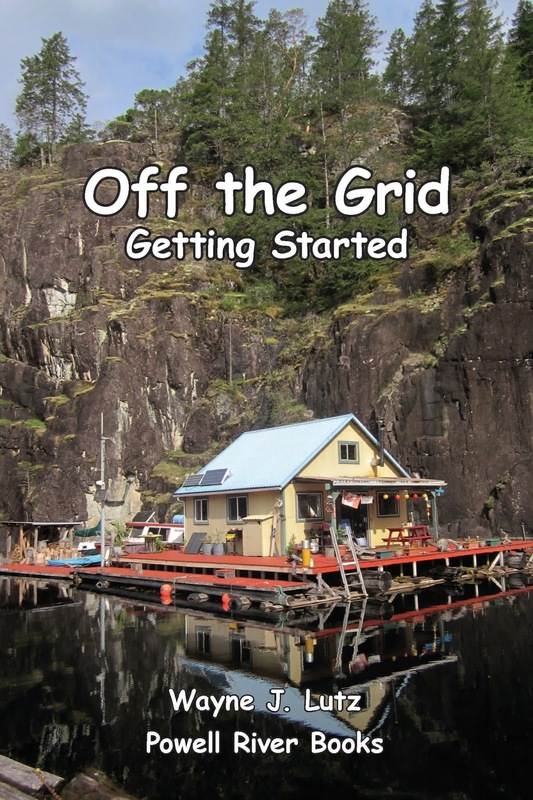 Living off the grid, you are responsible for your own safety and first response. Wayne and I did took some extra safety measures after the emergency preparedness presentation at Cabin Owners Association AGM. We developed a emergency folder with important information, purchased a larger fire extinguisher, updated our first aid supplies, purchased a strobe light to signal passing boats, and reviewed our cell phone and marine radio procedures. Beginning in 1910, 1he company town (now called the Townsite) for the Powell River pulp and paper mill was built on the southeast side of the Powell River. On the other side of the river were thick woods and few people. At first, boats and rafts had to be used to traverse the river. But in 1916, a bridge was built to provide better access for shingle mill operations and residents living on the other side. An article in Powell River Magazine chronicles the development of Wildwood. Supports for the old Wildwood Bridge are still visible in the river. 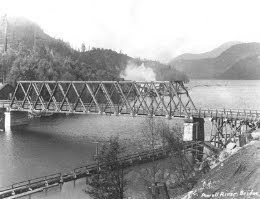 This picture of the old bridge is from the Powell River Museum archives. When the BC government offered 40-60 acre homesteads for pre-emption in 1914, settlement across the river increased. Many Italian immigrants chose to live in Wildwood and developed a close knit farming community that remains today. The bridge may be gone, but the strong supports endure. Powell River is only 500 metres long, running from the bottom of Powell Lake to the paper mill's dam that was built in 1910. Here you can see the river widen into the bottom of Powell Lake with the Shinglemill (Powell Lake) Marina on the left. While fishing on Powell Lake, Wayne and I had an amazing experience. 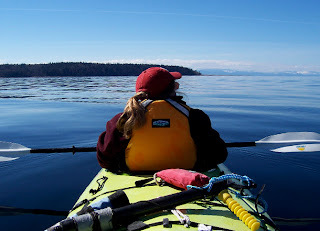 We were trolling in First Narrows. Wayne was trying to get his line out. I looked up the lake and saw what looked like a bumpy log, but it was moving faster and in a different direction than the wind. So rather than finish putting out our lines, we went over to investigate. As we came near, we realized it was a black bear swimming for shore. Last night over the Strait of Georgia near Powell River, BC, we saw this bright light in the sky. It appeared just after sunset over Texada Island. From the trails in the sky, it appears there was an earlier one to the right. My guess is it was either rockets or high intensity flares test fired from a ship in Military Exercise Area WG (Whiskey Golf to locals) on the other side of the strait. P-0849(2012) STRAIT OF GEORGIA - WG Activated:0426 14 Jun 2012 Military Exercise Area WG (north of Nanaimo), shown on Canadian charts 3463 and 3512 will be active across the full range area on June 14, 2012 from 0700 until 2100 PDT for surface-subsurface-air operations. Area WG is extremely hazardous during operations and is closed to marine traffic. She's a bit more than a boat, she's a BC Ferry. The Island Sky is one of the newest ships in the fleet. After four and a half years from concept to completion, she went into service on the Earls Cove to Saltary Bay run on February 19, 2009. That's important for people who live in Powell River, BC. She's the first link in getting from our ocean locked mainland to the big city of Vancouver. I was lucky enough to ride her when she was almost new. She's a 102-metre, 125-car intermediate size ferry built by the Vancouver Shipyard. She holds 600 passengers and 125 vehicles of all shapes and sizes. We just took a ride on the Island Sky to bring Mom and Stick Tail (her companion cat) up to visit us for a few weeks. 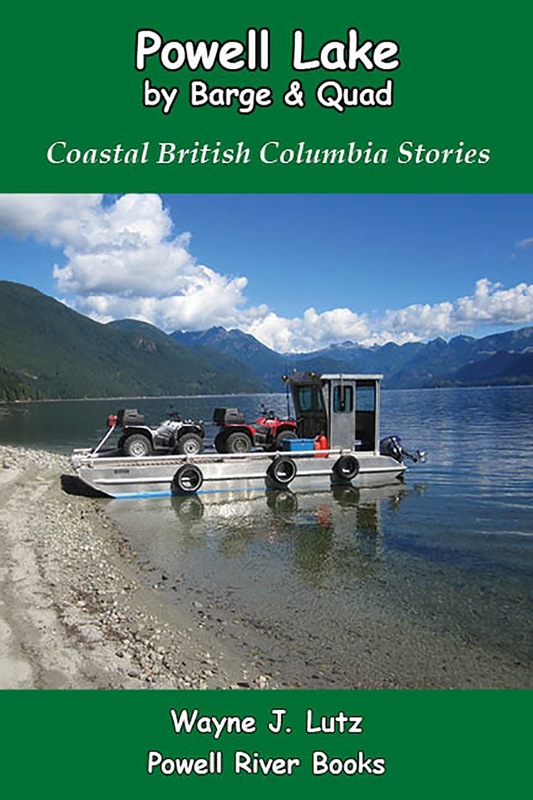 One of the first books Wayne and I read about boating along the BC coast was the classic The Curve of Time by M. Wylie Blanchet. This intrepid woman, recently widowed, took her five children and dog cruising in a 25-foot boat called The Caprice each summer. Her memoir from the 20's and 30's chronicles finding remote anchorages, meeting unusual characters, and learning to live all together in a tiny little space. 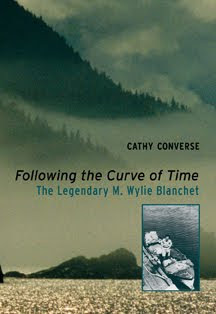 In 2008, Cathy Converse published the biography Following the Curve of Time: The Legendary M. Wylie Blancet. Not only did Converse retrace the life of this very private woman, but she also followed her cruising path up and down the British Columbia coast. Things have really changed over the years. Where rugged individuals once lived in the wilderness, now homesteads sit abandoned. But the immense ocean and landscape endures. Where few boaters once ventured, now summer visitors flock to take in the supernatural expanses. 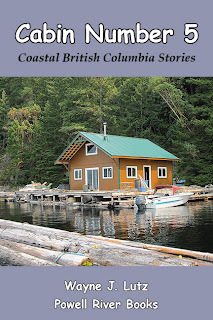 M. Wylie (Capi to her friends) lead an interesting, if reclusive, life both on the water and Vancouver Island. Through Cathy's research, the woman behind the story comes to life once again. 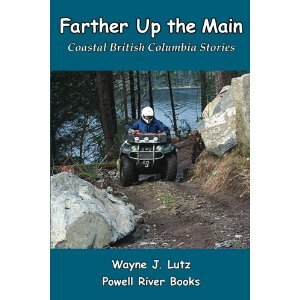 Following the Curve of Time is available at local bookstores, on BC Ferries, as well as online in both print and Kindle/ebook versions. Sounds like a good title for a B-horror movie doesn't it? A more common name for tent worms, is tent caterpillars. Each year, the Tent Caterpillar Moth (Malacosoma californicum) lays eggs on the stem of a deciduous tree. Favourite ones include aspens, cottonwoods, fruit trees, and in our area, alders. The eggs mature, but remain dormant until the following spring when tree leaves are at their prime. After hatching, the tiny caterpillars build a tent they can use for protection and warmth in colder weather. When conditions are right, they wander off and begin eating their host tree. One tent worth of caterpillars can strip a full grown tree of about 20% of its leaves during the six weeks that the little furry critters feast. Then they form a cocoon to transform into a moth, starting the process all over. Every 5-10 years for some unknown reason there is a population explosion. Tent caterpillars multiply in horrific numbers, denuding trees, getting under foot, and leaving a trail of poop pellets everywhere. And this is the year for Vancouver Island and the Sunshine Coast. In the next few weeks we'll be inundated and our trees turned into a bare shadow of their former selves. Fortunately, a healthy tree can survive the onslaught and regrow the leaves needed for photosynthesis by mid-summer. A full moon is always a treat at our cabin up the lake. I love it when I can go out at night and the light of the moon makes everything stand out in relief.